I save everything into Evernote. While I’m almost religious about plain text and Markdown for my articles, anything else goes into Evernote: PDFs, screenshots, photos with GPS information, my shared shopping list, and any other note that has a visual component (such as formatting or hyperlinks). I started using Evernote in 2009, and it’s become an external brain where I archive everything that I need to remember but not store in my own brain. Evernote suffered in its transition to iOS devices as it couldn’t be as flexible as the Mac app: Evernote is only as good as the ways it gives you to create notes, and the iOS app couldn’t use the best one – the clipper. This is changing today with Evernote 7.5, which adds extensions for iOS 8 to let you save anything from anywhere with just two taps. For Evernote, quick note creation has always been an issue on the iOS platform. The app couldn’t extend beyond its sandbox and users had to open the app to create notes; this was in stark contrast with Evernote for the desktop, which offers a web clipper, a bookmarklet, and, on OS X, a menu bar popup to type anything and save it for later. With iOS 8, Evernote decided to address the problem of quick note creation in two ways: a widget and a share extension. The widget is simple, but useful. 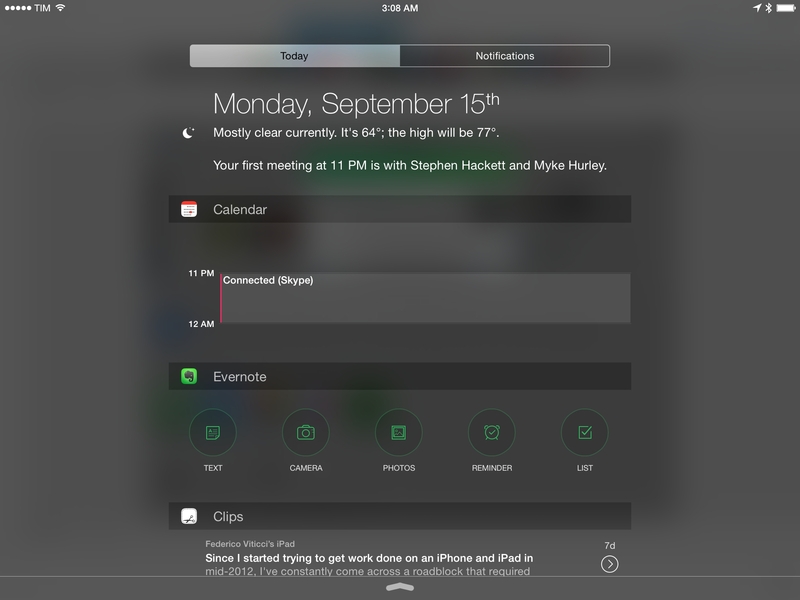 Once enabled, Evernote can display five buttons in the Today view of Notification Center to let you create a text note, a reminder, a checklist, or notes with photos from the camera or your library. When tapped, these buttons go directly to the relevant section in the Evernote app: the Camera button will launch the camera mode in Evernote, while the list one will start a new checklist and let you type the first item. It’s a basic but handy widget, and I’ve been using it every day to quickly create new text or photo notes. The share extension is amazing. Instead of building an iOS version of the web clipper, Evernote created an extension to save any kind of file or data from any app – not just Safari. You can save PDFs and zip files with the share extension; you can save webpages, which will keep formatting and inline images; you can save selections from webpages; you can save apps from the App Store and they will keep their icon and link; you can open the Photos app and save photos or screenshots directly into Evernote. Everything happens inside a little share sheet reminiscent of the ones Apple designed for Twitter and Facebook. There’s a text field to type a note title, a button to browse your notebooks and choose your destination, and a thumbnail preview of the note. The share extension is also capable of detecting the kind of note that you want to save: if you share a photo, it’ll create a note with an inline image; Safari will make Evernote clip a full webpage; a document management app will give a file to Evernote, which will add it as an attachment to a new note. 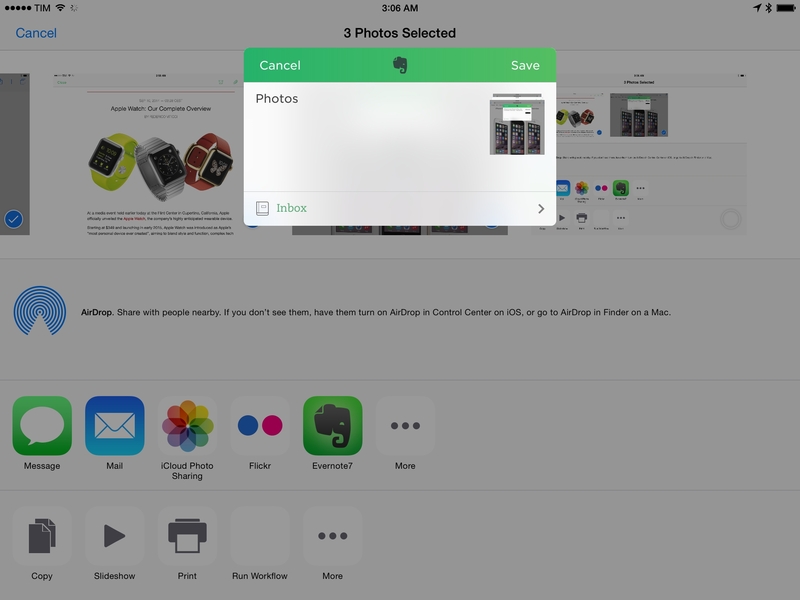 Evernote's share extension in the Photos app. 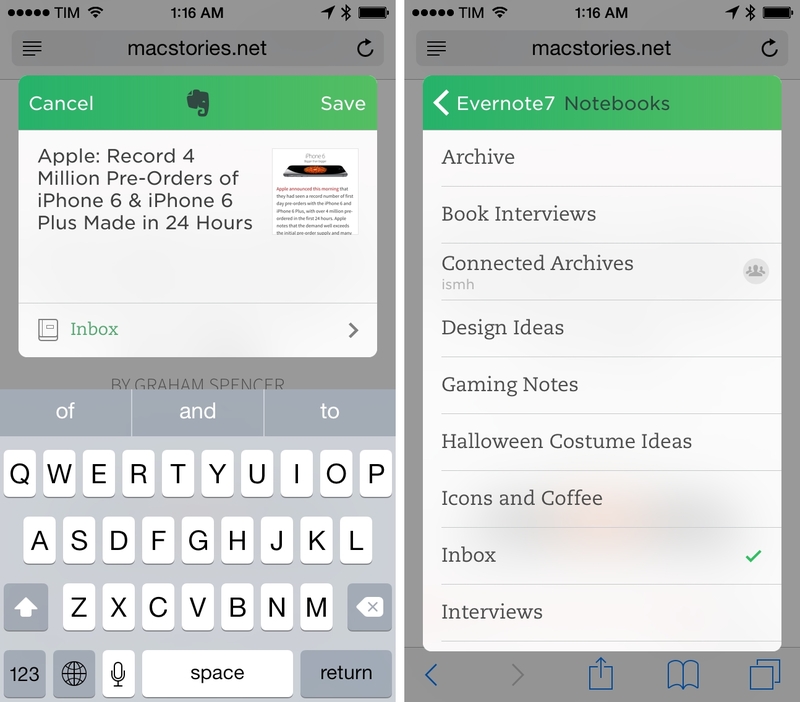 The first version of Evernote’s extension for iOS 8 isn’t as full-featured as the service’s web clipper for OS X. You can’t annotate images or highlight web content before saving – you can’t even assign tags from the share sheet – and I hope that Evernote will bring the more advanced capabilities of the desktop clipper to iOS soon. 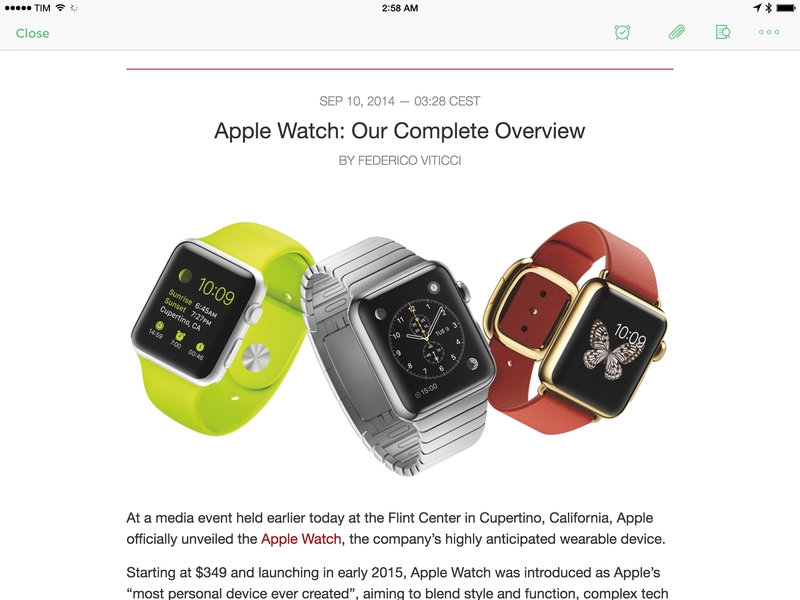 A webpage clipped in Evernote for iOS via the extension. I’ve been using Evernote for years, and the ability to save text and files from anywhere is the most important update the app received so far – much more relevant and practical than last year’s redesign for users who rely on the app on a daily basis. I used to hack my way around scripts and third-party apps to perform a common task such as saving a string of text to Evernote; now, I can hit share from anywhere and save anything I want into Evernote. The widget and share extension have reinvented note creation in Evernote for my workflow, and I can’t wait to see how they’ll evolve. Evernote 7.5 is available on the App Store.